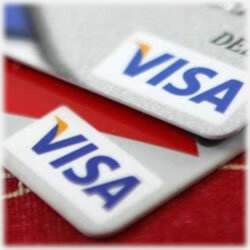 Visa is synonymous with credit cards; many consumers, regardless of any other credit cards they carry, most often have at least one with the Visa logo. It symbolizes trust and reliability. If you’re looking for a versatile card, you can’t go wrong with Visa. Here are a few credit card offers that include that globally recognized V.
For those who like cash back, the Visa Black Card is a good choice. There are many perks when you choose this credit card, though there is a $495 annual fee for the privilege of using this Visa credit card. That said, the perks are pretty incredible. You’ll enjoy, among other things, an exclusive rewards program, 24 hour concierge service, travel lounge priority pass, no restrictions or blackouts. The 1% cash back is definitely an incentive for many. The United Mileage Plus Explorer Visa offers including 40,000 bonus points (worth up to $95) during your first year; this, of course, cancels out the $95 annual fee you’re charged each year. Also, Chase offers what it calls “once in a lifetime events” for its cardholders and as such, you’ll have exclusive access. This Visa miles rewards card is made for those who appreciate everything traveling the word offers. One of the stronger selling points with this credit card offer is that you don’t have to worry about those miles expiring – ever. Not only that, but there’s absolutely no limit on how many miles you can earn. There are no pre-set spending limits and the Visa Zero Liability program protects you from fraudulent charges. Maintain your account online and a year-end summary statement is available, perfect for handing over to your accountant at the end of the year. The Simmons First Visa Platinum Rewards Card will require an excellent credit rating to qualify. You’re rewarded handsomely upon approval, including a no 0% APR intro rate. There are also no transfer fees for you to worry about. Easily transfer balances online or via phone. It’s considered a universal rewards card, meaning its applicable to most anything you wish to apply them to, including travel points. The strong selling point with this offer is the simplicity involved. Cardholders enjoy complimentary travel accident insurance, emergency cash and card replacement. It really is a great card to have, either as a primary or secondary credit card you save for emergencies. For those who appreciate the benefits and convenience of a secured credit card, or are looking to improve their credit scores, the Applied Bank Secured Visa Gold credit card is a great choice. No matter the reasons for choosing a secured credit card, this Visa has no annual fees to worry about. It reports to all three credit bureaus and you decide your credit limit based on your deposit. It can be as little as $200 or as much as $5,000. The Chase network has many offers, including the Chase Slate Vertical Card with Blueprint. This Visa credit card offers a 0% APR for up to 15 months. After this intro rate expires, your interest rate can be as low as 11.99% and up to 21.99%, based on your credit history. You’ll also earn a $75 statement credit after your first $300 in charges during the first ninety days. This is a favored card for many who are looking for a good choice that allows balance transfers – and this Chase Visa just might be the right one. There is no rewards program associated with this particular credit card; however, you’ll never pay an annual fee, making it worth your consideration especially if a rewards program isn’t your biggest incentive. The Slate Blueprint network allows you to pay down your balances faster, thereby saving money on interest fees. Clearly, there are no shortage of Visa credit card offers on the market today. With so many varied offers, there’s sure to be one that meets all your needs. As always, be sure to carefully review any terms and conditions and you might want to consider requesting a free credit report before you apply, just so you know there are no errors that would equate to a higher APR.